Renault also rolled out their new car, the R30, today... and there are a few surprises. It's the first of the 2010 racers to have a low-slung nose. The idealist would suggest that they've found that it's better than the high nose. The cynic, however, will say that all the prevaricating over coming back that Renault did last year prevented them from doing enough design work to discover the possible benefits of the high nose. The sidepod air intakes are larger and lower than the other new releases as well. The front wing is pretty generic, but that'd be easy to change. 1 Very nice! I'm really liking these 2010 cars. 2 And nobody shows off the diffuser area, ke ke ke. 3 Yah. The closest I could find was, actually, Renault's rear... which had a trash bag over the diffuser. We'll see more on Monday. One of the reasons the P-51 Mustang was so fast was that the engine cooling air was ducted out the bottom rear and yielded additional thrust, something called the Meredith Effect. 5 Well, looking online, it appears that the Meredith Effect (which I had never heard of before just now) is useful only at much higher power levels than that generated by a F1 car. Which isn't to say that it's non-existent at lower speeds, just perhaps not worth the trouble. The various ducts and piping and what-have-you the engineers would need to install to get the small bonus it'd generate... would probably counter the bonus and add extra complexity to the car. Would it be legal? I think the answer clearly would be 'yes.' There's already some (very) small oomph generated by the exhaust system. The Meredith Effect would just add to that. Of course, if a team DID manage to get a measurable and worthwhile bonus from it, the FIA would probably outlaw it, much the same way they did the fan car, and probably for the same reason. 7 I can't even think of all the ways that'd mess with the aero of the car behind... but it made me snicker just the same. 8 Hey, you tailgate, you get what you deserve. The principle obviously was well-known in the English-speaking part of the aviation industry as well. "Fundamentals of Fighter Design" by Ray Whitford notes (p. 61): "In 1926 it was realized that airflow through the radiators on liquid-cooled engines could, if properly ducted, eliminate the cooling drag and even produce a little thrust at speeds above 260 kts (483 km/h)." "
10 But you want tailgating, and positive effects from traveling in another car's slipstream, because that promotes running closely to other cars and passing, and makes the race more exciting. If it's just a battle to see who wins the pole and gets to fire up their afterburner first, well, why even bother to watch the race? Or run it, for that matter? 11 Naah, it just makes pitstop times more important. 13 You can pass at Monaco, it's just incredibly difficult and generally counter-productive as you usually end up breaking your car. 14 I wonder what's up with all the smaller teams. Only majors turned up for the first testing sessions. 15 Well, you'll note that Red Bull themselves aren't at this session. They and Force India will be debuting on Feb 10th. Lotus will be bringing out their car on the 12th. USF1 will be running at the Barber Motorsport Park in Alabama sometime "early in February." I can't find anything about Virgin F1 and Campos Meta. 16 Correction: Virgin is apparently going to be rolling out on Wednesday, Feb 3, with a "private test" at Silverstone on Thursday and Friday. It was a low-key debut, but SauberF1 brought out their new car today. I think they're a little behind schedule, however. The aerodynamics have got to be awful. Okay, okay, click below for the real pictures. Hmmm, I'm hoping that the lack of sponsor decals doesn't mean they don't have any. From the side, the simple black and white looks like the car is wearing a tuxedo. Very elegant. Not a full F1 Pr0n entry as the car hasn't yet officially debuted, but the Williams took their new car, the FW32, out for a pre-test shakedown run at Silverstone a couple of days ago. Y'know, "kick the tires, make sure everything stays in one piece, turn a few burn a few," that sort of thing. It was supposed to be a secret thing, not for public consumption. Of course, the car could still change between now and the first test session on Monday, but there's that high nose again! The front wing seems pretty high off the ground, but look at the tires: those are full wet treaded; a weather-related high downforce setup? Maybe Williams doesn't have the final nose on there? We'll find out for sure on Monday. From the front, McLaren's 2010 challenger doesn't seem too different from the 2009 car. The nose is higher, but the betting line is that that'll be the norm this season (with the wider front tires last year, the lower nose allowed more ballast to be placed up front. This season's narrower tires will require a better balance all-round, so the high nose won't hinder anything). 1 I really really like that fin. Has anyone ever done that before? 2 The Red Bull RB5 had a long fin by the end of the season, but not quite like this one. So, yes, I guess it has been done, but there's something about the McLaren fin that's different. I can't quite put my finger on why. Ah, I got it. This one looks like it connects to the rear wing; the RB5's didn't. 3 Awesome look! Love that fin! I believe the fin is designed to control yaw in and smooth out airflow the concept has been around for a few seasons now but Mclaren Merc have never run with it. could be using it to cure last years rear downforce problems. 5 When Red Bull introduced the fin on the RB4 back in 2008, the thought was that it improved stability over the rear under braking. The Legendary Announce Team predicted that it'd be copied quickly, even if nobody had the slightest idea why it worked or what it did, because that's the way F1 design works. Everybody steals from everybody else. Legendary Announce Team? Say what? 7 The Pond's official nickname for SPEED's F1 announcers. They're quite good. Ahhhh I guess I'm just used to the BBC commentary and presentation team. At casual glance, it looks pretty much like last year's car, but let's take a comparative glance at the 2009 F60, shall we? The first thing that leaps out you is the sidepods. On the F60, they go straight across the top, but the F10 is curved, bulging at the outsides. The nose wing is subtly different as well. 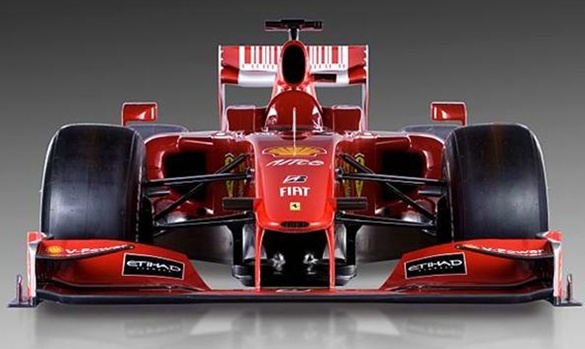 The middle element on the new car, where the Santander logo picture is located, just stops when it reaches the inner limit. On the F60, they slope down to the limit point. The air intake has changed, with a more squashed appearance in comparison to the 2009 car. Other changes are visible on the rear wing and where the sidepods meet the monocoque; look at the Ferrari logo and you'll see what I mean. So the only reason to go into the pits this year is for new tires? I don't know if I like that. Pitstop strategy for fuel (2 or 3 times?) was part of the game, and a way that the team managers to be involved. 2 Look up the presentation by Ferrari design chief Nikolas Tombazis. He said most dramatic changes are in the rear suspension and structure that was widened to accomodate the double diffuser. The rest of the car was not changed as much. So pictures of the back would be most telling. 3 Steven, the teams still have to use two tire compounds/race, so there'll still be stops... they'll just be four seconds long instead of seven. Historically, there have been quite a few more seasons that didn't allow refueling than those that did. I actually don't mind the loss of fuel stops that much. I DO mind the fact that the FIA screwed with the rules again, but I can live with it. Pete, I'll see what I can find. 4 The good side of them screwing with the rules is that it's no longer McLaren/Ferrarri and a bunch of losers. The game is more competitive now. 6 You don't happen to know what is that sword they are carrying on top in testing? 7 It's an antenna for all the extra telemetry equipment the cars carry during testing, Pete. Today, Mercedes-Sauber F1 debuted... their paintjob. The idea behind the livery is that it's a throwback to the original "silver arrows" of Mercedes. Back in the day-- if the day you're talking about is 1934 or thereabouts-- the Mercedes team was going to join the Eifelrennen, but their car was too heavy for the weight restrictions. So the night before, the team sanded all the paint off, leaving just the silver chassis behind. And a legend was born. Today's paintjob is meant to pay tribute to that one (which really wasn't a paintjob). The car is (obviously) silver, but has part of it "sanded off", revealing the black carbon fiber underneath (not really, it's just paint, but run with it, okay?). The greenish-blue on the leading edges of the nose and other places is the color of Petronas, the team's major sponsor. The chassis this paintjob (actually, vinyl decal, but let's go with paintjob) is on isn't the 2010 MGP W01, but last year's Brawn car. We should be seeing the new car later this week, when the first FIA practice session begins. So stay tuned! 1 Wow, that's quite an impressive paintjob! So glad the pre-season hype has started. 2 Is it really legal for the front wing to be so low to the ground? 4 The idea is to move the front wing out of the turbulence created by the rear wing of the car in front. But of course it does not work because the rest of car body creates vortexes too. 35kb generated in CPU 0.07, elapsed 0.196 seconds. 49 queries taking 0.1516 seconds, 153 records returned.